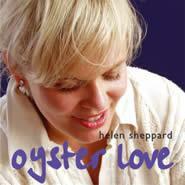 Oyster Love is the second CD by the hugely talented singer/song-writer Helen Sheppard. Her first CD Hello Tomorrow released in autumn 2003 got an enthusiastic reception from the media, and her courage to ignore the standard songbook and go her own way was widely noticed by reviewers. Less than a year since the release of her first CD, Helen Sheppard comes up with twelve new songs, some of which are destined to become jazz standards. Again, her songs and her magnificent voice are instantly identifiable, but her second CD is closer to jazz than the first one, partly because she is accompanied by a band of brightest young talents on the conte jazz scene: Zoe Rahman on piano, Andy Coleman on trumpet and flugel-horn, Riaan Vosloo on bass, and Pat Illingworth on drums.